Return to ShopBack and click through to Klook every time you are making a new transaction. Klook Deal: Cherry Blossom - Grab Code "MYSAKURAFEVER" & enjoy RM55 off with RM900 min spend. Promotion ends 30 April 2019. Get RM55 off on activities deals via Klook with code MYSAKURAFEVER. RM900 minimum spend required. Klook Deal: Cherry Blossom - Enjoy RM110 off with Promo Code "MYSAKURA110". RM1,300 min spend required (App Only). Promotion ends 30 April 2019. The 3% Upsized Cashback is open to Malaysian customers only. RM50 Klook Voucher is only valid for booking made by 30 April 2019. Full T&Cs are on Klook’s website. Klook Deal: RM25 off with RM500 min spend on Hong Kong & Macau activities with Promo Code "MYHKAPR". Promotion ends 30 April 2019. RM25 off Hong Kong & Macau Activities on Klook with Promo Code MYHKAPR. RM500 minimum spend required. Klook Deal: RM20 off with RM400 min spend on Singapore activities with Promo Code "MYSGAPR". Promotion ends 30 April 2019. RM20 off Singapore Activities on Klook with Promo Code MYSGAPR. RM400 minimum spend required. Klook Deal: RM30 off with RM600 min spend on Australia activities with Promo Code "MYAUAPR". Promotion ends 30 April 2019. RM30 off Australia Activities on Klook with Promo Code MYAUAPR. RM600 minimum spend required. Klook Deal: RM15 off with RM300 min spend on Malaysia activities with Promo Code "MYAPR25". Promotion ends 30 April 2019. RM15 off Malaysia Activities on Klook with Promo Code MYAPR25. RM300 minimum spend required. Enjoy 45% discount on Australia Dreamworld Ticket using Klook Promo Coupon! Get 14% off on Tickets on The House of Dancing Water(Macau) with Klook promo! Enjoy Up to 9% off on Food Tour with Aodai Rider in Da Nang. No Klook promo Code needed. Klook promo: Get 4% off on South Korea Tea Ceremony & Kimchi Making Activity! Enjoy 40% discount on Robot Restaurant In Shinjuku using Klook Discount Coupon! Klook Promo: Tokyo Skytree & Asakusa Tour Deal 4% discount! Use Voucher to Avail Discount. Klook promo: Enjoy 25% off on Hong Kong Peak Tram Fast-Track Combo! Subscribe To Klook's Newsletter To Get the Latest Deals with 60% Discount! 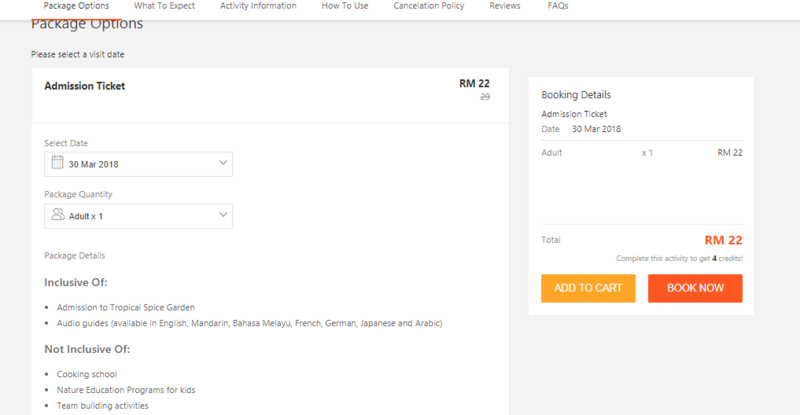 Klook Promo: Tokyo Disneyland and DisneySea ticket FROM RM269! 15% OFF on Hong Kong Disneyland Park Ticket! Discover Unique Tours & Experiences Across 120+ Destinations w/ Klook. Book Now! Get 10% OFF Universal Studios Singapore Halloween Horror Nights 8! Get 50% OFF Bangkok Transport & WiFi Exclusive on Klook! Up To 30% OFF Hong Kong Activities & Experiences on Klook! Along with an extensive range of tours and activities, Klook Malaysia also offers customers huge rewards on their bookings in the form of Klook promo codes, coupons and other special offers. In addition, when you shop via ShopBack, you can also enjoy additional Klook cashback as an added benefit. You can also follow the brand on social media (Facebook, Twitter and Instagram) for the latest offers and discounts. For similar services, be sure to check out the following Trip.com and Adventoro. Some of the best deals for Klook Malaysia on ShopBack have been detailed below. Travel experiences Up to 3.5% Cashback Discover and book amazing travel experiences with Klook! Klook is a leading travel and tour online platform that offers travel enthusiasts a simple way to discover activities, attractions and things to do wherever you travel. Klook enables you to discover and book in-destination services at the best prices. With a few taps or clicks, you can be ready to hop aboard the Hong Kong Airport Express, set your inner child free at Tokyo Disneyland, or marvel at the breath-taking world under the waves in Bali. At Klook, their mission is to make it simple for everyone to enjoy everything a destination offers. The company believes that travel should be all play and no work. With so many activities waiting to be discovered, their goal is to connect travellers with the experiences they want and need. The journey of Klook began in 2014 and is the brainchild of founders Eric Gnock Fah, Ethan Lin, and technology engineer, Bernie Xiong. They realised that when it comes to planning travel, there were several solutions to book flights and hotels but not for itinerary planning or booking specific tours and attractions available in the local area. With an influx of funds from Sequoia Capital, the company was able to realise its dream and now operates in over 100 destinations worldwide. Klook experts all over the world uncover and curate the best experiences every day. They have over 2,000,000 user reviews on their site allowing new users an option to get an authentic look at the experiences. As the official partner of top attractions and operators worldwide, Klook ensures all their offerings deliver quality experiences at the best price. In case any user can find a better deal, they will refund the difference. The Klook platform's intuitive design and strict security measure ensure that every customer has a seamless and secure booking experience. Planning a trip or deciding on a spontaneous getaway has never been easier. With Klook, travel enthusiasts are just a click away from booking their adventure at the best price. To book a tour on Klook, simply follow the steps outlined below. Step 1: On the website, enter the destination or activity you are interested in. You can also choose from the hot and popular destinations on the drop-down menu. Step 2: You will be redirected to the best travel experiences for your destination. You can also filter the search by choosing relevant options from the left-hand side menu such as Attractions or shows, food, Wi-Fi, activities etc. In addition, you can also sort the results according to Klook suggestions, Popularity, Ratings or Price, by selecting from the tab on the top-right hand side of the page. Step 3: Click on the experience that you like to see detailed information. Here, you will be able to read reviews written by other travellers as well as see all important information regarding the experience. In case all the details are suitable, click on ‘Book. You can even add the experience to your wish list to plan it at a later date. Step 4: Enter the date and number of travellers to finalise your booking. Be sure to check all the details carefully before proceeding to payment. In case you have a Klook Malaysia promo code, don’t forget to enter it in the box provided for a discount with Klook deals. Step 5: You will then be redirected to a page where you will need to enter traveller details as well as finalise the payment to make the payment. Once the payment has been processed, you will receive an Order Summary email, listing the activities you booked, as well as a separate email with your e-voucher attached. It will also be accessible within your account on the website and within your app account. When you see 'Instant' on an activity, it means that when you complete the payment, you will receive your booking voucher within 5 minutes. If you do not receive a voucher please first check your Spam folder before contacting Klook. In a rare case that you haven't received the e-voucher immediately after you book an 'instant' activity, the Klook Support staff will generally be in touch within 24 hours to assist you. In this section travellers can find tour packages for the most popular tourist destinations as determined by the travel community. Be it Macau, Singapore or Hong Kong, Klook has a host of exciting tours and deals to get you to your dream destination without breaking the bank. A lot of these are also inclusive of Klook coupons for added savings. These are a list of the favourite experiences booked by travellers. Here, one can find a wide range of exciting activities and experiences at a discount with Klook deals. Also, don’t forget to look for a Klook promo code to enjoy more savings. This section comprises of specially curated suggestions based on seasons, festivals and interests. 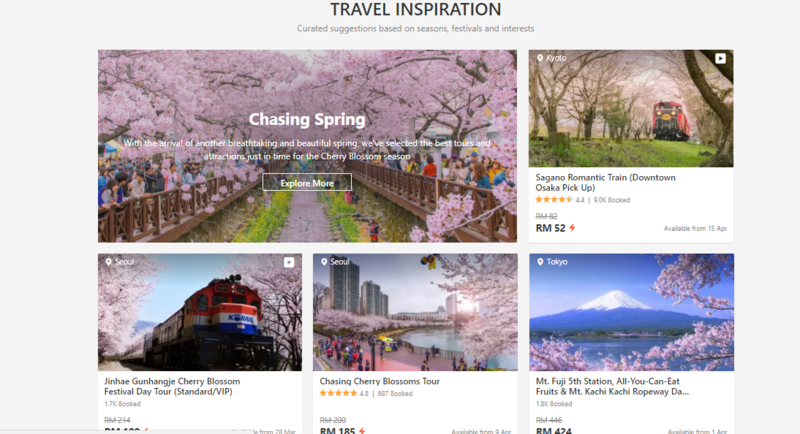 If seeing the cherry blossom in Tokyo or some other seasonal activity is on your wish list, then this is the section for you. Amazing tours and activities that offer seasonal experiences can be found here. Whether one spontaneously decides to take a vacation or plans ahead, these seasonal exclusives are a once-in-a-lifetime experience that should never be missed. With exciting Klook deals or a latest Klook voucher, you can save your money and book your tickets for a dream vacation. Comprising of the best activities handpicked by Klook’s travel curators, this section combines innovative activities at popular destinations for an added charm. Along with regular tourist activities and sight-seeing destinations, travellers can book their holiday here for an exclusive experience. In order to facilitate unique experiences along with comfortable travel, Klook has also partnered with several service providers for a seamless experience. A host of rigorous checks and due-diligence help ensure that they only work with the most trustworthy and credible service providers so that you can explore and experience the world with more confidence. To ensure complete safety and security of payments, travellers pay through Klook when they make a booking. At present when booking a tour on Klook, customers can choose to pay by credit/debit card, or PayPal. You get Klook credits every time you book an activity. In addition, Klook offers a rebate in the form of Klook Credit at 5 - 10% of the booking value for each activity completed. The conversion for credits is considered as 10 Klook Credits = 1 HKD (the currency is adjusted when booking). The more activities you complete, the more credits you will earn. Once you have collected more than 10 credits, you may use these credits towards your next purchase. Customers can apply their credits by ticking the box in the 'Promotion' section of the checkout page when making a booking on the website. When making a booking on the app, after entering the relevant Traveller’s Information, you can choose to 'Redeem Klook Credits' on the following page. Choose 'Select Credits' to determine the amount of credits you wish to apply to the booking. Credits are valid until 31st December the year following the year you received the credits. For example, credits received on 1 Jan 2017 will expire on 31 Dec 2018. Credits received on 31 Dec 2017 will expire on 31 Dec 2018. You can share your unique referral Klook code or link to invite friends to sign up to Klook. Every friend you invite will receive HK$25 (US$3.2) in Klook credits. When that friend books and completes a Klook experience, you will also receive HK$25 in Klook credits. You will receive your Klook credits only after your friend completes the experience. For example, if your friend books a tour today for a date in 2 weeks' time, you will receive your credit in 2 weeks after your friend finishes the tour. Please allow 24 hours for the credit to appear in your account. On the website, you can click to enter a promo code in the 'Promotion' section on the checkout page. The discount will be deducted from your order before the payment page, please check the correct discount has been applied before you confirm payment. On the app, after entering the relevant Traveller’s Information, you can tap 'Apply Promotion Code' on the following page, enter the Klook coupon code and tap 'Redeem' to apply the special offer that is applicable to your booking. Alternatively, you may access your account by click the icon in the bottom-right corner of the app, then tap 'Promotions', where you can enter and save the Promotion Code for future use. On the Klook App, when you enter a promotion code into the 'Promotions' section of your account, you will be issued a coupon which will be saved in your account. You can apply this coupon at check out on future bookings (within the redemption period). Step 1: Visit the ShopBack website and click on the Klook store at the bottom of the homepage. You can also use the search box to find the link to the merchant store. Step 3: If you are interested in finding a Klook discount code, check out the Klook coupons, vouchers and promo codes section. Step 4: You will be redirected to the Klook Malaysia website to browse and select the tours. Step 5: When you book your travel, you will be eligible to earn cashback from ShopBack. The cashback rates may differ based on tour categories and based on whether you are a new or an existing customer. Before booking a tour or activity be sure to read the details regarding the tour’s cancellation and refund policy. In the rare case that an activity that you have booked is cancelled, Klook will give you the option of booking an alternative date or requesting a full refund. To initiate cancellation or refund, in case it is applicable, customers in Malaysia can e-mail the customer care team or call their hotline number for the same. Refund may take time based on your original form of payment. If your initial payment was made via PayPal, the refund will be processed instantly after Klook files the refund. If you paid by credit card, it usually takes 5 - 7 working days, or up to 30 days for certain banks, for you to receive the refund in your account. The Klook support team is available to assist you in English, Cantonese and Mandarin, by email at support@klook.com, or via online chat 24 hours a day.